Norma has always been an ammunition designer that pushes the limits of what a bullet can do. The 308 Norma Magnum is no different. Norma took the 30 caliber round in 1960 and stretched its limits of performance to produce an extremely potent and powerful round. The 308 Norma magnum is not considered a mass production round and is traditionally used by the most discerning of shooters. 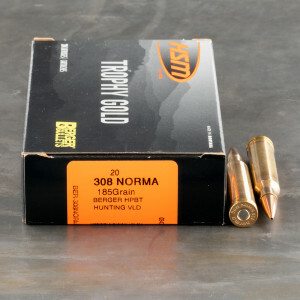 The 308 Norma mag produces a significant amount of recoil, muzzle blast, and concussion, this limits the round to experienced hunters and target shooters. The cartridge generates impressive velocity, coming in at only a hair under 3,000 feet per second with a 180 grain bullet. This delivers over 3,400 foot pounds of energy transferred into a target.